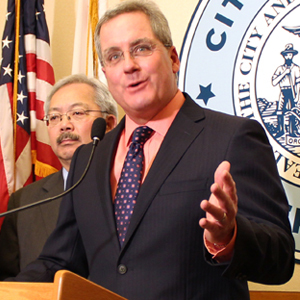 SAN FRANCISCO (March 8, 2017) — City Attorney Dennis Herrera today asked a federal judge to halt enforcement nationwide of President Donald Trump’s executive order denying federal funding to “sanctuary jurisdictions,” saying the order not only violated the Constitution but also undermined bedrock democratic principles. According to the motion for a preliminary injunction filed today in U.S. District Court in the Northern District of California, Trump’s executive order ignores the separation of powers in our country, grants the president authority he is not entitled to under the Constitution, and tramples on state sovereignty. Herrera is seeking a preliminary injunction — a court order that maintains the status quo as a legal case plays out — that would prohibit Trump and his administration from denying federal funding to cities and counties across the country that they deem to be “sanctuary jurisdictions.” Today’s motion also seeks a court ruling stating that San Francisco’s sanctuary laws comply with federal law and preventing the Trump administration from declaring the city ineligible for federal funds. The move comes after San Francisco on Jan. 31, 2017 became the first city in the country to sue President Trump over his unconstitutional sanctuary executive order. Santa Clara County and two Massachusetts cities, Lawrence and Chelsea, followed. Of the $1.2 billion in federal funds that San Francisco receives for its annual operating budget, 92 percent goes to entitlement programs like Medicare, Medicaid, Temporary Assistance to Needy Families, and Supplemental Nutrition Assistance Programs, the city’s legal filing notes. San Francisco also receives an additional $800 million in multi-year grants, the vast majority of which fund capital projects like building bridges and public transportation that create jobs. Federal funds have not been withheld yet, but most of San Francisco’s federal funds are provided on a reimbursement basis, meaning the city first spends its own money and then is repaid. Fundamental budget decisions are looming. The mayor must make key budget decisions by May 15 and submit a balanced budget to the Board of Supervisors by June 1. In the months since the executive order was issued, San Francisco has moved closer to these deadlines with no clarification from the Trump administration on how or when the order will be applied. San Francisco needs clarity now. Unless there is clarification from the administration or an order from the court, San Francisco will be forced to create a budget reserve to help compensate for a potential loss in federal funding. Money placed in reserve will not be available for other purposes until the fiscal year is over, meaning it cannot be used for San Francisco to fund other budget priorities, such as reducing homelessness through family shelter expansions, youth housing subsidies and a resource center. There is a reason more than 400 cities and counties across this country — including nearly every major city — have sanctuary policies. Sanctuary counties have less crime, fewer people in poverty and lower unemployment than other counties, according to a recent study by Tom K. Wong, an associate professor of political science at the University of California, San Diego, released by the Center for American Progress. Sanctuary policies encourage undocumented immigrants who are the victims or witnesses of crimes to report them so that cities can investigate and prosecute, getting violent criminals off the street. These policies also encourage immigrants to send their children to school and go to public health clinics, which makes the entire community more prosperous and healthy. Some think that sanctuary city policies protect criminals, but that is incorrect. If the federal government has a criminal warrant, San Francisco honors that. San Francisco’s laws are designed to increase public safety and be fully consistent with federal law. They leave immigration matters where they belong — in the hands of federal officials, not local law enforcement. The fiscal coercion Trump is attempting violates the Constitution in three different ways, according to Herrera’s filing today. It purports to assert legislative power that the Constitution vests exclusively in Congress, exercises that spending power in ways that even Congress may not, and commandeers local jurisdictions, violating the Tenth Amendment by requiring them to comply with Immigration and Customs Enforcement detainer requests. Compliance with those requests is voluntary and is not required under federal law. Complying with a detainer request keeps a person incarcerated after they’ve been legally cleared for release. Courts have ruled that detaining people after they would otherwise have been released is unconstitutional.